Plymouth Congregational Church of Lawrence, Kansas is an affiliate of the United Church of Christ that was established in 1854, months after the Territory of Kansas was opened to settlement. 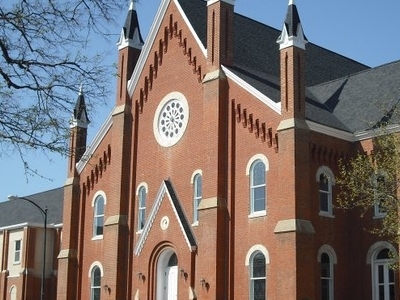 The present-day church building, built in 1870, is listed on the National Register of Historic Places. The architect was John G. Haskell who was among the architects of the Kansas State Capitol. The Territory of Kansas was opened to settlement by the Kansas–Nebraska Act on May 30, 1854. Reverend Samuel Y. Lum of Middletown, New York was sent by the American Home Missionary Society to establish what was to become the first church in the new city of Lawrence and the entire Kansas Territory. Prior to his arrival, sermon readings were conducted by laymen. The first service of Plymouth Congregational Church was held by Lum on October 1, 1854 in a mudbrick boarding house, also called the "hay tent," with settlers who had come from New England. Reverend Richard Cordley became pastor in 1857, when the congregation moved into its first permanent building, called the "Stone Church," though it was not completed until 1862. Cordley was an abolitionist and supported the free state movement. During the American Civil War, several members were killed by pro-Confederate forces led by William Quantrill in the Lawrence Massacre of 1863. Cordley's home was burned, but the church building survived without damage. Cordley was influential in documenting such events in the early settlement of Kansas. Here's the our members favorite photos of "Churches in Lawrence". Upload your photo of Plymouth Congregational Church!